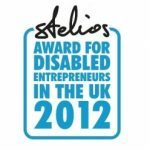 Disabled Hull businessman David Hawkins has won a prestigious award from easyJet founder Sir Stelios Haji-Ioannou at the Stelios Award for Disabled Entrepreneurs 2012. David has overcome many challenges to set up his thriving firm, Cyclone Technologies. Now, he is enjoying his moment in the sun after Sir Stelios identified his business as simply the best. David, 56, who is paraplegic, has seen off tough competition to win the award, a competition run by the Stelios Philanthropic Foundation and the charity Leonard Cheshire Disability. Now in its sixth year, the award recognises the unique achievements of disabled entrepreneurs and offers a £50,000 cash prize to the winner – the largest cash sum of its kind. Cyclone Technologies supplies wheelchairs and fitness equipment to disabled people in the UK and Ireland, importing products from the USA, Europe and Israel. David owns 50% of the business, which he set up with colleague Stuart Dunne, who also uses a wheelchair, in 2009. Their products include bespoke, lightweight wheelchairs, accessible gym equipment, Functional Electrical Stimulation equipment (designed for people with spinal injuries or neuromuscular conditions) and ReWalk, mobility devices for people with severe walking impairments. This year David and his team supported Claire Lomas, who was paralysed in a horse riding accident five years ago, to do the London Marathon in a ReWalk suit. The suit helped her move her knees and hips to let her walk at the flick of a button through a computer-based control system and motion sensors. They helped her train and also gave her support throughout her challenge. In their head office in rural East Yorkshire, an area of high unemployment, David and Stuart employ only local workers. Their sales team is made up solely of wheelchair users covering the whole of the UK and Ireland. But setting up a growing, healthy business wasn’t all blue skies for David. In 1980 he was driving to work when he had a road accident and acquired a spinal injury. He says: “I used to work in building and joinery, but after becoming paraplegic I had to move away from my original career path and retrain myself completely. I had to develop skills and knowledge of an industry of which I had no previous experience. “One advantage of running a business aimed at other disabled people is that I have found I can empathise with my customers. I am at an advantage when I am choosing products and demonstrating their benefits to potential customers because we have faced similar hurdles. I have found this to be hugely rewarding, and hope I can continue to find innovative new products to introduce into the UK market to enable disabled people to have access to the best products. David was announced winner of the 2012 Stelios Award for Disabled Entrepreneurs in the UK at a special awards ceremony held in London on 3 December 2012, the International Day of Persons with Disabilities. Sir Stelios says: “I have been really impressed by David’s business, his drive and enthusiasm. Clare Pelham,Chief Executive of Leonard Cheshire Disability says: “I would like to congratulate David on winning this award. Be the first to comment on "Hull entrepreneur’s talent wins award from Sir Stelios"